My name is Michael Kinsey and I am a member of Troop 28 in Colleyville, Texas. I have been involved in Scouting for 11 years. I am currently working on my Eagle Project and could use your help. About six years ago I was bitten by a tick while camping and as a result I contracted Lyme disease and other infections. For the last 4 years, I have been homebound attending school at home through the school district. Unfortunately for me, the Lyme went to my brain and has given me constant daily headaches. My Eagle Project is to benefit Texas A & M research on Lyme and other pathogens in the state of Texas. As part of their study they will identify the type of tick and whether they are carrying any diseases. Their goal is to map the entire state of Texas. Doctors in Texas do not believe that there is Lyme in Texas so for the last four years I have had to fly to California for treatment. The project involves getting Troops across Texas to help by doing tick drags. As part of my project I have developed a tick drag kit that has most of the materials needed to perform the tick drag. The only materials you supply are duct tape, walking stick or pole, alcohol for shipping ticks, and smart phone to record date/time/location. Your kit comes with the instructions or you can also read them on my website. Tick drags can be performed in parks, nature reserves, camps, or anyplace there is natural (not maintained) tall grass and undergrowth. Tick drags can be accomplished in an hour and be incorporated into your regular camping trip or make a great short excursion. If you would be willing to help me on my project, please send an e-mail to: eagle.project@tickdrag.com with your name & shipping address, phone number and date the kit is needed. My goal is to help A & M further their research of ticks and Lyme in Texas. Thanks for considering helping me with my Eagle project in support of the Texas A & M Lyme Lab. Stop the presses!! On-Line Membership Applications are Coming!! 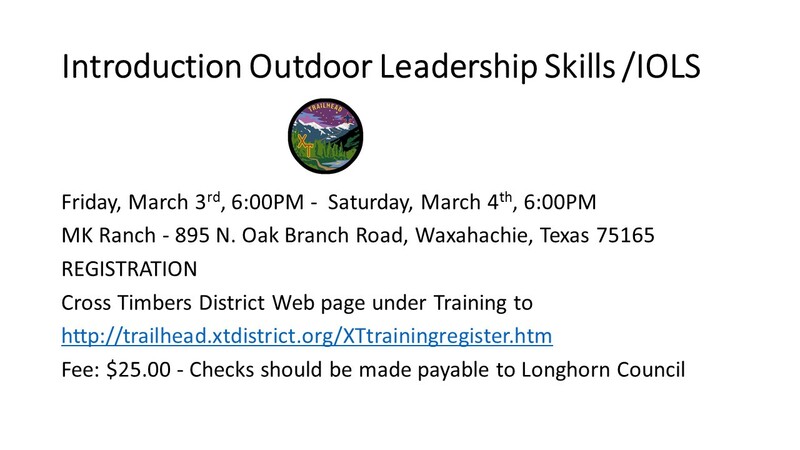 On-Line Membership Applications are Coming!! 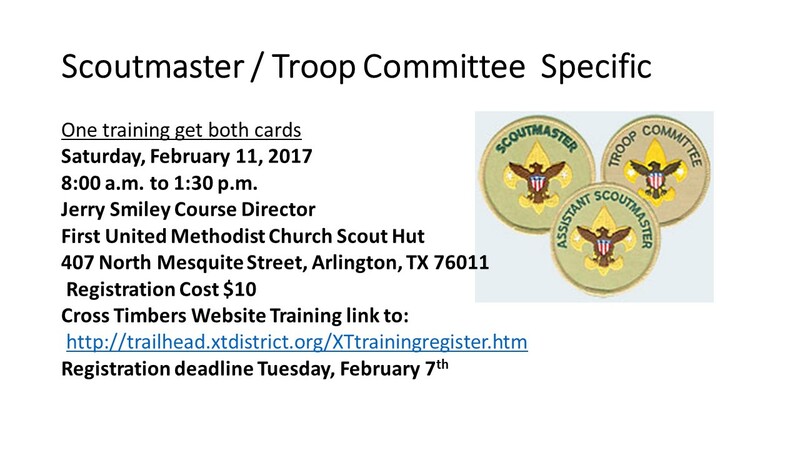 Be sure and update your unit’s info for BEASCOUT.ORG!! Access is on my.scouting.org under Legacy Tools! District Camporee is next weekend!! And volunteer to help with Boy Scout and Cub Scout events! The weather forecast is looking GREAT!!! Please see the attached information on 2017 Camp Cards. Many NEW things……please read carefully!! Camp Cards must be requested on-line or by the attached form in February!! Camp Cards will be available for pick up at the March Roundtable. I have discovered 2 new hammock makers that warrant a look. Hobo and Bearbutt appear to be well made and at a great price.. If you buy one, please let me know what you think.. I have been hanging for about 6 years now, and have slept well in 9degrees to 100+, raining, and more. Having a good hammock is only part of the equation, pair that with a good pad, possibly a wrap for cold weather. the most important is a good tarp, possibly a bug net.. I personally have several brands of hammock and have found my perfect setup..
Straps are nice, however I have often used a good climbing assessor cord.. the key is to find rope or webbing that does not stretch.. Eno atlas is the best for 200lbs or more. If you have any questions, want to advice or just compare setups, give me a holler.